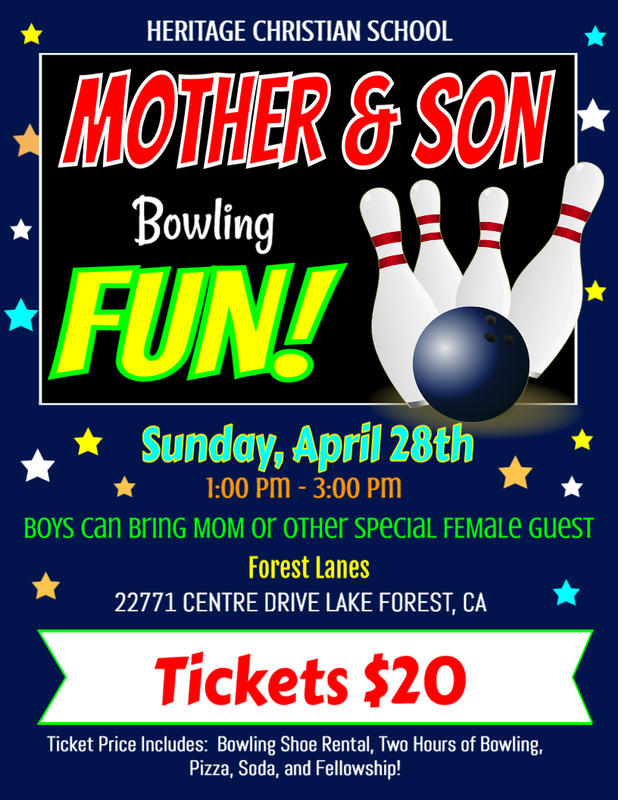 Mother & Son Bowling FUN @ Forest Lanes! Register online now for Sunday, April 28th 1:00 PM – 3:00 PM. If you would still like to register using a paper form, please click on the Registration Form button below to download the form. Ticket price includes: Bowling shoe rental, two fun hours of bowling, pizza, soda, and fellowship! Your credit/debit card will be charged the following amount when you hit "submit" on this form. Father/Daughter Dance @ Norman P. Murray Center on Friday, May 17th 6:00 PM – 9:00 PM. If you would like to print a copy of this flyer, please download the form by clicking the button below. I am so excited to inform you that God has provided a wonderful opportunity through a faithful and generous donor. This faithful donor has pledged a $50,000 matching gift if our Heritage Family, friends and associates will diligently raise $50,000 by June 1, 2019! What a great challenge and what an amazing opportunity to add $100,000 for our school! Our Board of Trustees have determined to designate the funds towards Student Financial Assistance, Campus Capital, Technology and Resources, and Professional Development for our wonderful teachers and staff. As a result, 100% of monies donated will be designated for the direct benefit of our HCS students, teachers, staff and families. Each of us can help by giving any amount that we can. Please involve your family, friends, business associates, and anyone else that you feel would like to help. You may donate here through our website or submit your donation to our school office. Please be sure to write Match the Mission donation on the memo of your check. Full participation is a must! We need every family to participate. Again, give what you can. Every donation is doubled; a $100 gift automatically turns into a $200 donation. This is an amazing opportunity for our school to generate $100,000 in only 7 weeks! 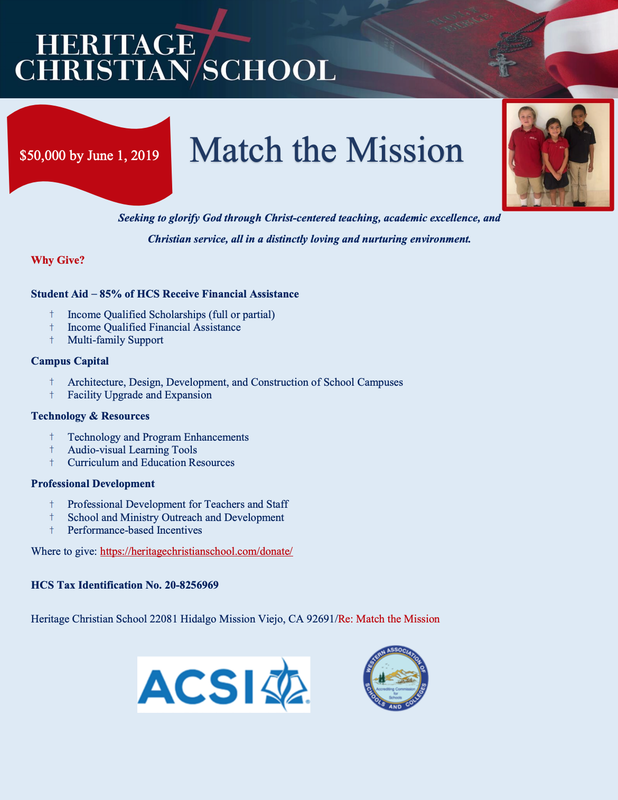 Spread the word about our Match The Mission! Heritage Christian School is a non profit 501 c(3) Tax ID # 20-8256969 all donations are 100% tax deductible. © 2019 Heritage Christian School. Site by Gradelink.